No bond is stronger than the one held between siblings. Well, except for that shared by twins. A person’s twin is with them even before birth, and they will be with them throughout their entire lives. Even if the twins are not identical, they share DNA and thought processes that bring them close together. Twins have been known to share senses, read each other’s minds, and demonstrate other skills that suggest that there is much more at play than meets the eye. This set of twins is probably the cutest you will ever see. 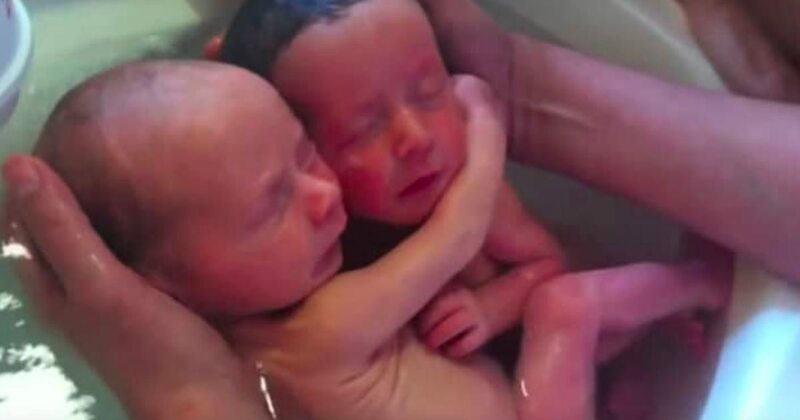 Images from their birth have taken the internet by storm, and for good reason. You’ll be gushing when you see this adorable pair. 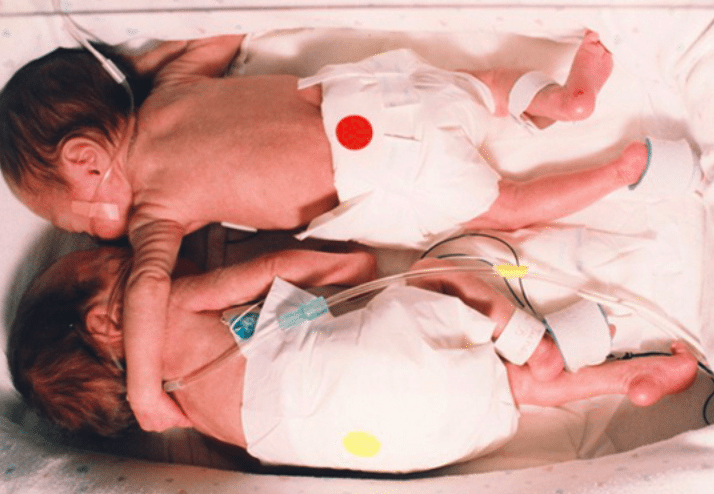 The twins were born healthy and normal – well, as normal as anyone could want them to be. Unlike other newborns, these babies didn’t seem to be aware that they had left their mother’s womb. Their interaction just moments after entering this world has left people all everywhere in awe. The nurse placed the twins into the water and held them side by side. She kept them up so that only their backs were submerged, and she shifted them around in the water. The twins stayed calm the entire time. It wasn’t their wonderful demeanor, however, that has captured the hearts of millions. As the two laid down in the warm water, they slowly scooted closer together. They held each other tight in an embrace that would warm any mother’s heart. 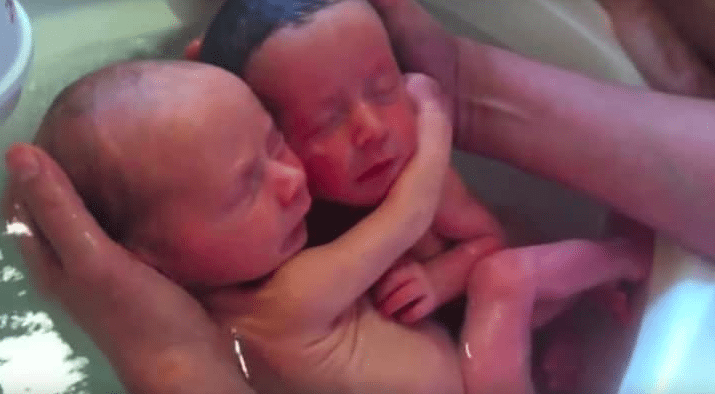 As the twins were bathed, they clung to each other the entire time. They never cried, opened their eyes, or resisted the flow of the water. Did they even know they had been born? It’s impossible to say. One thing is absolutely certain: these two will grow up with a strong bond, and their friendship will last a lifetime. These babies seem to be so in tune with each other. They pull each other closer and closer, and they really love being together. Watching twins stick together is a magical thing, and sometimes having a sibling by one’s side can make all the difference in the world. Another set of twins proved how valuable their bond was when they used love to save each other. 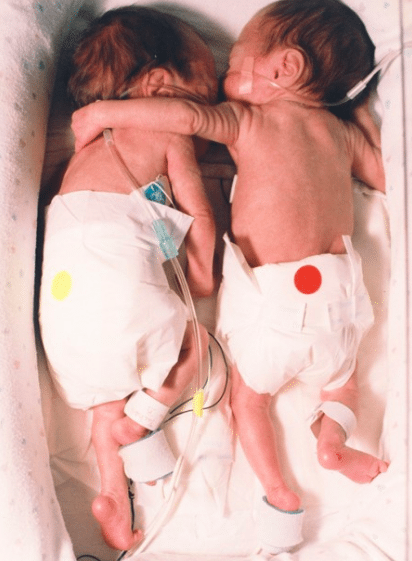 These two, named Brielle and Kylie, were born 12 weeks premature. One was born slightly larger than the other, but both were just barely clinging to life. As they laid down on their bellies side by side, the bigger twin wrapped her tiny arm around her sister. As the girl held her sister close, she actually changed her medical condition. Doctors had been worried that this smaller twin wouldn’t survive, and they were already preparing for the worst. They were shocked to watch her health change merely by her sister’s touch. This warm embrace caused the smaller twin’s heart to stabilize. Since the two were now sharing body heat, her body temperature also returned to a healthy degree. It is incredible how a simple hug from her sibling actually saved her life. There is nothing sweeter than watching two twin babies care for each other. Yes, it is more work to raise a set of twins, but it is also more of a blessing. With a twin your little one will always have a best friend, a playmate, and a shoulder to lean on. The parents who have been able to witness these stunning miracles are so fortunate. 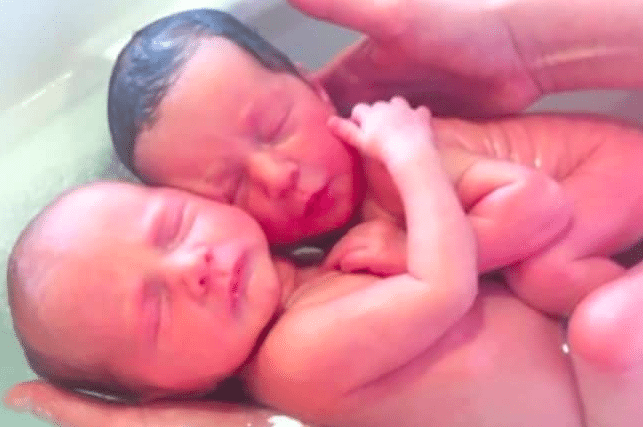 The internet is sure to watch attentively as these loving twins continue to warm our hearts.